All Ages Show Benefits for Bands for Lands at Wazee Union, Sept. 4, 3pm – ? Experience unique performance art, live music, amazing robots and machines, props, fight choreography, and projectile fake blood in a visual and audio extravaganza certain to be a feast for the senses. 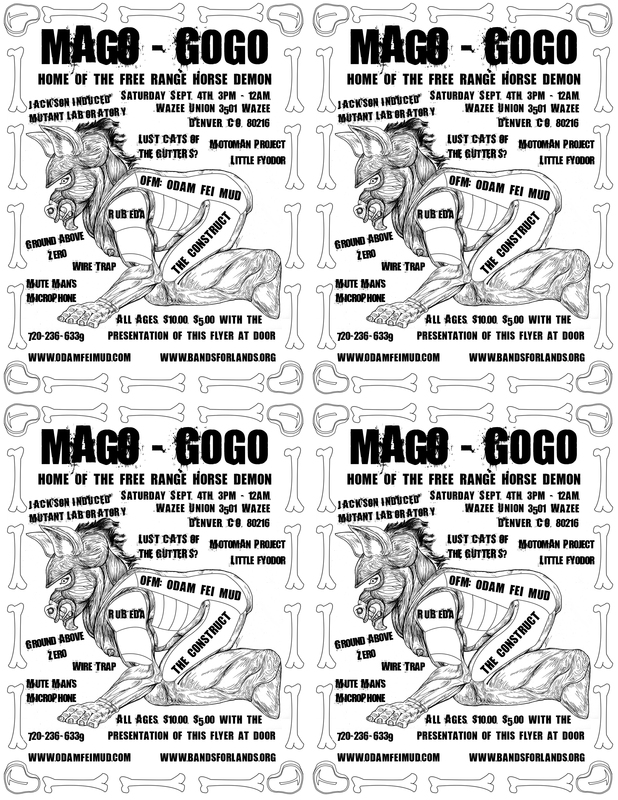 Mago-Gogo features additional acts. This includes the avant pop maestro Little Fyodor, progressive art rock duo the Construct rocking on their vehicle that in true Hasbro style-transforms into a stage, Lust Cats of the Gutters, Ground Above Zero, Lust Cats the industrial duo Wiretrap, Rubedo, Mute Man Microphone, and Jackson Induced Mutant Laboratory.